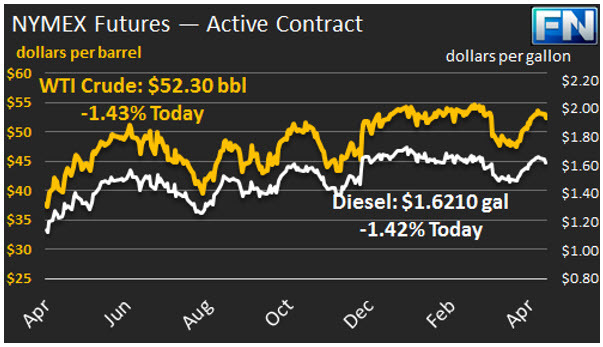 WTI crude prices retreated to the $52.00-$52.50/b range this morning. Yesterday morning brought a price surge, followed by a sell-off that continued overnight. WTI opened at $52.75/b today, a decrease of $0.22 below Thursday’s opening price. 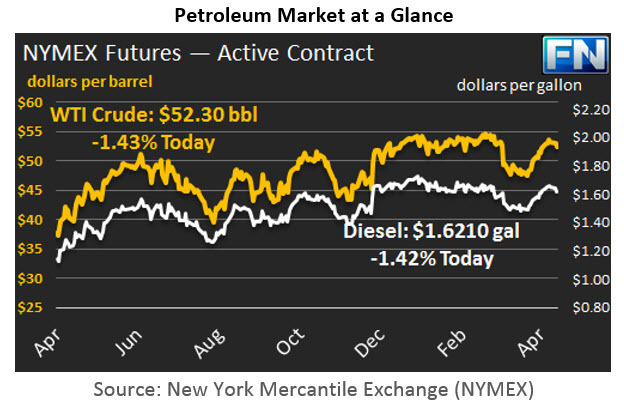 Current prices are $52.30/b, $0.35 below Monday’s close. Product prices also surged yesterday morning before heading down again. Diesel opened at $1.6343/gallon in today’s session. This was a decrease of 1.27 cents (0.77%) below Monday’s opening price. Current prices are $1.621/gallon, down by 1.19 cents from yesterday’s closing price. Gasoline opened at $1.7229/gallon today, a drop of 1.04 cents, or 0.6%, from yesterday’s opening. Prices are $1.7069/gallon currently, down by 1.27 cents from yesterday’s close. The market appears to be downplaying geopolitical risk factors over North Korea’s recent failed ballistic missile test. For the moment, the U.S. is looking to China to pressure North Korea into backing down, and to eventually dismantling its nuclear weapons program. The administration has stated that it is considering all possible responses, emphasizing its recent willingness to use military force, and reportedly is sending a U.S. carrier strike group to the region. Note: The EIA is experiencing technical difficulties that have delayed the release of gasoline and diesel retail price data. Our normally scheduled analysis will appear in tomorrow’s newsletter, pending data release.